I love watching football. During the NFL season, I’ll wrap up work in the shop early on a Sunday afternoon, call the kids in from the backyard, pop some popcorn, heat up some hot wings and the three of us will sit and watch a solid ten hours of games. The live drama. The hard hits. The raw emotion and energy. We cheer our fool heads off and eat all the foods we know we can’t have during the week. In football, as in all professional sports, you start to notice that there is a sort of unwritten rule that most players follow. For example, in an after game press conference, you might see one team’s star running back or linebacker who had a career day tell the reporters, “We played a hard game against a tough team. The win was great, but there are some things we have got to work on to improve our game.” It always amazes me that you’ll hear this coming from the mouths of players or coaches – even after an impressive win. Don’t they know they just crushed the opposing team? Why doesn’t anyone ever admit to playing a perfect game? Many woodworkers do the same thing with their projects. I’ve done it. You’ve done it. We all have done it. Here’s an example that happens to me. After three or four months of planning, picking out lumber, cutting precision joints and buffing the final finish to a lustrous shine, my wife walks into the shop. Soon, I find myself on my hands and knees pointing out a drop of dried glue under the bottom shelf that only the dust bunnies will ever see. That’s when my wife will say something like, “Well, I think this is a very nice piece,” turn around and go back into the house as I frantically search for more major snafus lurking in my work. Why on Earth do we do this to ourselves? Do we gain some type of masochistic joy in beating ourselves up over the slightest goof? If you worked in an office where your boss came in after every project – even projects that win universal acclaim – and verbally flogged you for the smallest mistake, like not formatting the page footer exactly as she would have, would you stay at that job? After a while, most folks would hit the bricks, and anyone who stayed would be hard pressed to find any joy in coming to work. Then why would you do that to yourself? Remember, in this case, you have to live with your boss every stinkin’ day. To help regain my sanity – if I had any to start with – I had to create a new process when it came time to show my work to someone. Even though I have a list of the boo boos in my head, I’ll invite my wife into the shop and have her take a look at the finished project. I have to FORCE myself to be quiet while she takes in the piece. When she gets close to where the foul up is, I have to fight the urge to blurt out what she should be looking for as she runs her hand over the finished wood. Sometimes, I have to grab the vise handle and squeeze it while she picks up the smaller pieces and gives them a thorough once over. I sweat as she opens the doors and drawers, wondering if they are going to fall off the hinges or runners. “I like it. Good job” Then, she leaves the shop. I exhale hard. The tension drains. Maybe my mistakes REALLY aren’t as bad as I thought they were at first. Maybe you really do need an electron microscope to see that not-too-gappy joint that looks as big as the Grand Canyon in my eyes. That’s when I start doing my end zone touchdown dance! Get a group of woodworkers together, and, eventually, the topic of Norm Abram will come up. It’s not difficult to figure out why. 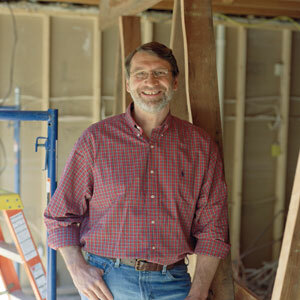 He’s been a fixture on This Old House since the show’s inception in 1979 – nearly three decades. This year, the New Yankee Workshop marks its 20th anniversary. He’s built projects that can fit in nearly every room of the house – including the workshop! Different period styles – from the plain, strong lines of Shaker to the ornate Hepplewhite – have been tackled in detail. He’s worked with high-tech plywood and antique timbers. His plaid shirts, safety glasses and beard are as essential to his persona as Santa Claus’ red, fur-trimmed suit and black boots. Reliance on the brad nailer. Looking at several seasons of the New Yankee Workshop, you’d wonder if anything could be built without the ubiquitous brad nailer. Norm uses it for assembly of dust frames, setting shelves into dadoes, attaching face frames and a whole lot more. I’ve heard woodworkers pin this on his background as a carpenter instead of a true furniture maker. All those danged tools! “If I had a shop like that, I could build anything, too,” is a frequent lament of woodworkers – especially those who are just starting out. More than a dozen routers, a Unisaw, huge jointer – it would appear that Norm has just about every tool imaginable at his disposal. The biggest offender in the shop is the Time Saver wide belt sander. That piece of industrial equipment is well out of the price range of most hobby woodworkers. This tooling requirement is often seen as a reason why new woodworkers either go into massive debt or give up on the craft. More Power! In his first book, The New Yankee Workshop, Norm describes the philosophy behind the show. Old Yankee furniture masters relied on tried-and-true hand tool techniques. The New Yankee approach is to incorporate power tools into the traditional methods – seemingly shunning more traditional methods. Sometimes, it seems as if Norm spends quite a good deal of time jigging up a power tool to do something that could easily be done in a lot less time with the proper hand tool. He’s beholden to his sponsors. For years, whenever Norm used pocket screws, he turned to his Porter-Cable production machine – even though Kreg Tools has been offering pocket hole jigs at a much more affordable price since 1990. Fast and cheap. Plate or biscuit joinery has been used in European cabinet shops since its invention in 1956. When the technology jumped the Atlantic, Norm was an early adoptor. While the biscuit speeds production, many see it as a less-than-adequate way to create a joint. Some novice woodworkers will frequently use the biscuit where other, more appropriate joints should be used – in chair production, for example. Finish fussiness. Why do most New Yankee Workshop cherry projects come out looking so dark? True, many different styles of furniture did rely on dark finishes, but most modern tastes are dictating a natural look – letting the wood speak for itself. Cherry and Mahogany are two beautiful woods with just a clear finish on them. Norm, Inc. What do you get when you order plans for a project from the New Yankee website? A measured drawing. No step-by-step instructions. You want step-by-step? Add the DVD – a $15 upcharge – to the cost of the order. The final authority. “How would Norm do this?” Sure, he’s popular. His show is just about everywhere you look. And, many woodworkers see only this when they think of woodworking authorities. It took years for me to discover who Sam Maloof, Frank Klausz, Glen Huey, Doug Stowe and dozens of others of talented woodworkers are. Others like David Marks, Roy Underhill, Scott Phillips and Bob and Rick Rosendahl are on TV, but their growth has certainly taken place under the influence of the very popular New Yankee Workshop. He’s an encouraging force. It’s true that many of us grew up with a parent, grandparent, shop teacher, etc. to thank for our interest in woodworking. I’d be willing to bet that many hobby woodworkers got into the craft watching the New Yankee Workshop. Norm’s friendly, accessible personality has welcomed viewers and his clear explanations have taken away most of the mystery that existed around the craft. Just think how many woodworkers would not be building today if it weren’t for Norm. He’s come a long way, baby. Go back and watch some of the New Yankee Workshop’s early seasons. His spindle sander was a sleeve chucked in a drill press. His miter saw didn’t have a laser. He built a lot of jigs because he didn’t have his stable of tools. In other words, his shop has grown over time with the acquisition of new tools – just like every other woodworker’s, including mine. He’s getting back to the roots. In recent seasons, Norm has put down the Leigh jig and picked up the backsaw to cut dovetails. He’s used more hand tools to sculpt and form pieces, such as the top rail support in the Dominy Clock. He’s become more concerned with aesthetics – shying away from the brad nailer to more blind joining methods. He seems to be transitioning from his carpentry background to a more polished furniture making form. He’s diversifying. Over the past few years, Norm has added a number of new tools to his arsenal that aren’t the most expensive on the market. This season’s nine-part kitchen cabinet opus sees him using the affordable Kreg jig for pocket screwing face frames together. You have to admire this change in philosophy – a move to get beginners back to the table. He’s offering his wisdom for FREE! Good luck trying to get a talented woodworker to take the time to explain how the lathe works. Or how to build his jigs. Norm does offer his step-by-step instructions free every Saturday (in my market). All I have to do is DVR or – gasp – tape the episode, and I can go back to watch the technique until I get it right. So, where does this leave us? In my opinion, the case against Norm is overblown. He may have his detractors, but the contribution the guy has made to the craft can’t be ignored. If it wasn’t for Norm, where would This Old House – and the scores of home improvement shows that have followed since – be? How many folks would not have taken up the craft? And, with fewer woodworkers, how many manufacturers would have been so innovative over the past decade, bringing affordable new technology to the home workshop? What are your thoughts? How do you think history will judge the New Yankee Woodworker?